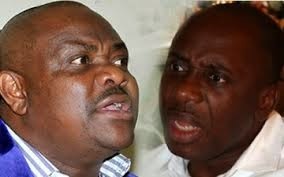 The Rivers State Governor-elect, Chief Nyesom Wike, has indicated his readiness to probe the Rotimi Amaechi administration after being sworn in as the chief executive of the state. Wike, who gave this hint while receiving the interim report of the Transition Committee in Port Harcourt on Monday, declared that his administration would carry out a forensic audit of all government accounts. He explained that the measure would enable him to recover funds that might have allegedly been stolen by top officials of the outgoing administration in the state. Wike specifically said that those who participated in the use of N4.5bn to conduct a local government election by the Rivers State Independent Electoral Commission, even when the court had stopped the exercise, would be made to account for their actions. The governor-elect maintained that RSIEC embarked on an illegal local government election despite the court’s position on the matter. Explaining that the days of impunity and corruption were over, Wike noted that Rivers would be a test case in the fight against corruption. He added that his administration would adopt a comprehensive approach in fighting corrupt elements in the outgoing administration in order to entrench fiscal discipline in the state. “I am not going to be intimidated. The only way we can work together is to check the ills of the past. The right thing must be done. Those who have stolen the resources of the state must be made to account for them. “I have the political will to drive the process to its logical conclusion. The massive stealing of government resources was a deliberate attempt to create problems for the incoming administration,” Wike said. The governor-elect declared that all backdated appointments and certificates of occupancy being hurriedly issued by outgoing governor would be set aside. “All the top officials of Amaechi administration who have refused to cooperate in the interest of Rivers State during the transition period will soon cooperate whether they like it or not. “Those who have closed the courts will be the same persons rushing to the courts when we open the courts,” Wike further declared. Earlier, the Chairman of the Transition Committee and state Deputy Governor, Mr. Tele Ikuru, had recommended that the new administration should carry out forensic audit of all accounts in view of an alleged looting by officials of the outgoing administration. Ikuru pointed out that Amaechi and top officials of his (Amaechi) administration refused to cooperate with the committee for a smooth transition. The deputy governor urged the governor-elect to work towards restoring basic services in the state.